By Matt Hinch. If, like me, you've never listened to Agrimonia before (or at least don't remember), that should have no effect on how much you may enjoy their fourth full-length, Awaken. Everyone has to start somewhere. 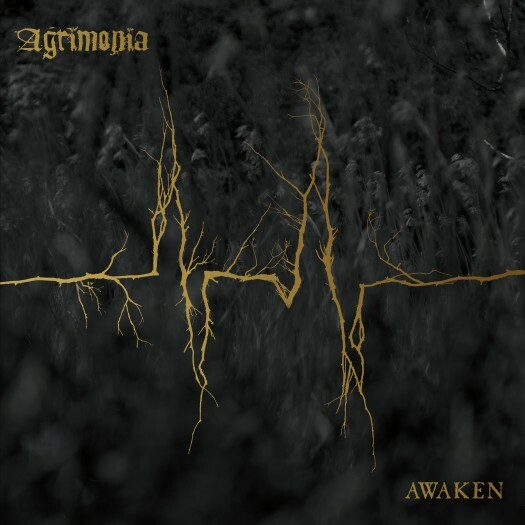 If, like me, you've never listened to Agrimonia before (or at least don't remember), that should have no effect on how much you may enjoy their fourth full-length, Awaken. Everyone has to start somewhere. Agrimonia may be from Sweden but Awaken feels more like it belongs in the U.K. Most bands that came to mind while listening were of the English variety. At least the death-doom ones. I don't really listen to the Peaceville Three either but I can hear their influence. Mind you, no one is going to mistake this for Paradise Lost. I also find that Awaken does the same things for me that Primordial does on a musical level but without the folk feel and the vocals here are far less triumphant and more dry, raspy, and demonic. It's the mix of power and melody that does it. At times they'll break you down with a powerful, hammering riff but you know it's just a matter of time before the melodies swoop in to pull the listener skyward. This may sound odd for an album such as this but it kind of makes you feel good. The dynamics are the strongest element Agrimonia put forth. Ethereal atmosphere and those ever-present melodies compete with the coarse vocals and charged riffing with the aid of acoustic flourish. The calculated layering gives Awaken a grand, spacious feel creating an immersive experience that given the proper attention can transport the listener to better places. They do vary the approach up though. It's not the same formula every time. “Foreshadowed” has a simpler, more ground and pound sound that comes across more “full sounding black metal” than “fast death-doom”. The title track takes things even further away from their core sound. It's basically an acoustic number with percussion and enveloping strings. Coming right after the fire of “Foreshadowed” it's a nice change of pace leading into the almost 13 minute “Withering”. That one has atmosphere to spare. Background synths swell beneath a desolate guitar line until everybody joins in and brings the darkness with them. There are swaying riffs, straightforward drive, a menacing swiftness that sweeps you from your feet, a good pummeling, and soothing parts to ease your wounds. Speeds and moods change multiple times challenging the listener to keep up but it's a terribly engaging track that never feels forced. Another highlight for this writer is “Sparrow”. It follows the usual path for the album moving between styles (in a broad sense) effortlessly. Bitter toned guitars slice through piano-assisted atmosphere creating that oppositional standard that dominates the album. There's an epic black metal vibe, a stomping death assault, forlorn melodies, more synths, and the chilling vocals all crashing into each other to eventually float off into the ether. As you can tell, there's a lot going on here and throughout the album. Awaken has the ability to capture you and subject them to darkness and pain yet fill your ears with so many melodies and other such accoutrements that the darkness is transcended and lifts you up with a sense of light. Awakening you from the night so to speak. More often than not I found myself hearing various things across the album that reminded me of Woods of Ypres. It doesn't carry the same emotional weight as Woods 5 but Awaken comes close. It is a powerful album ready and willing to dig deep and become part of you. Great albums provide an escape. Escape into this one. "Agrimonia may be from Sweden but Awaken feels more like it belongs in the U.K."
I don't know really, but I do know it's an amazing album. The songs on Awaken are on the level with The Unknown Bury Me from their demo, and that's the highest praise I can come up with.